The Joby GripTight Mount from the makers of the Gorillapod is a nice pocketable addition to your iphone photography toolkit. 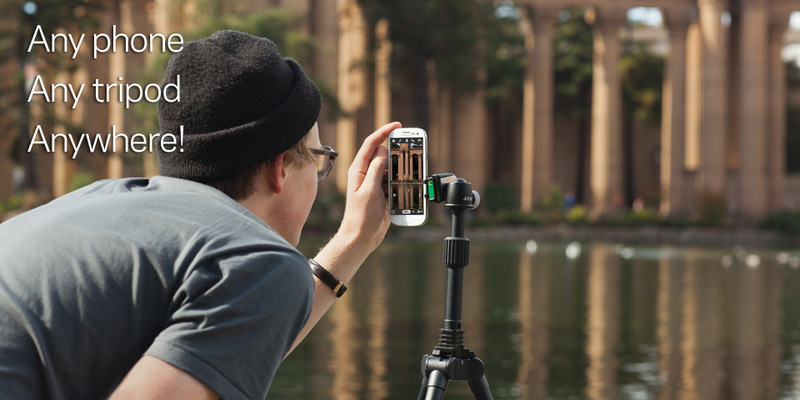 It opens up and fits onto any smart phone, not just iPhone, and screws into any tripod to provide instant stability for your photos. Take your phone photography up a notch with the GripTight Mount™ from JOBY, the only tripod mount that supports the best-selling smartphones, with or without a protective case. Compatible with GorillaPods™ and other tripods via a universal stainless steel ¼”-20 thread, the GripTight Mount stabilizes and positions your smartphone to give you steady video and crisp photos from new perspectives. The GripTight Mount will fit the phone you have now and the phone you’ll get next year, making it the perfect smartphone accessory. Designed with a durable steel inner frame and rubber grip pads, the Mount holds your phone in place, even when rotated sideways or upside down. 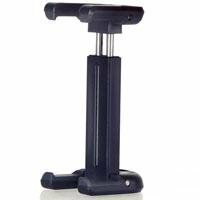 So get a grip on your smartphone camera, capture a short film on your iPhone, or shoot a street scene with your Android or Windows smartphone—it’s easy with your handy tripod and the GripTight Mount! How does it compare to other similiar devices out there such as the glif? Well, the fact that it doesn’t matter if your phone is in a case or not, factors pretty strongly into this. There’s also the fact that it doesn’t matter what type of phone you use it with, so you are open to new possibilities. The glif works well, but if you use a case, then you have to pop it out of the case, and also if you switch devices, then you are hooped. The GripTight Mount fits nicely in your pocket and can clip onto any tripod, and attaches to any smartphone, so you get a nice stable experience regardless of device or case the device is in.